Squat toilets are found throughout Africa and are especially common in Muslim countries like Morocco, Tunisia, and Algeria. Essentially, they are holes in the ground equipped with a pan to stand on, rather than the seat-and-bowl of Western toilet systems. Squat toilets are particularly common in bus or train stations, as well as local restaurants and budget hotels. Users need to be adept at squatting, and comfortable with using water to clean themselves rather than toilet paper. For first-timers, squat toilets can be a little intimidating but with practice, using them soon becomes second nature. Enter the squat toilet and look around for the available water supply. You should find a small tap with a bucket or bowl underneath. If it's not full already, fill the bowl before progressing to the next step. Place your feet on the footrests - two corrugated or ribbed parts on either side of the toilet. Face away from the hole (usually towards the door or entrance of the toilet). If you're wearing a dress or skirt, the next part's easy - but if you have to pull your clothes down, make sure that they stay off the ground. 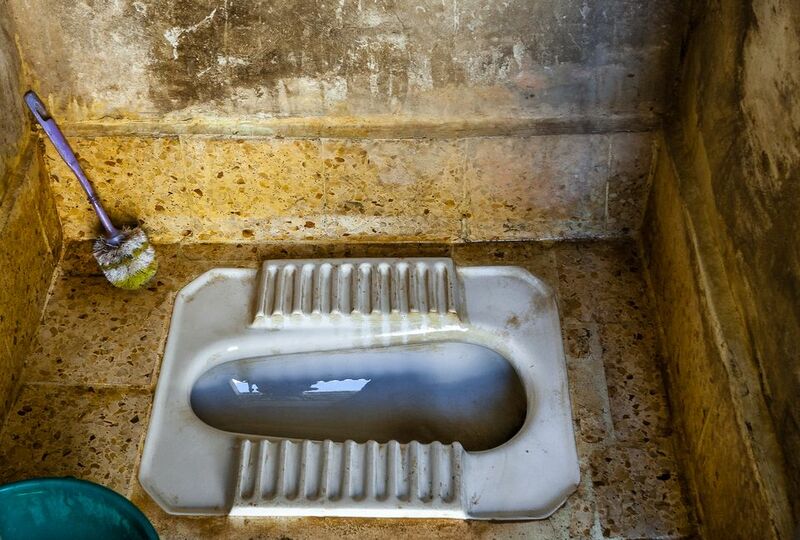 The floor of a squat toilet is usually wet (hopefully from the water used for washing, but sometimes because the previous user was an inexpert aimer). The safest thing to do is to remove your pants or shorts completely and hang them over the door (if there is one). Get into the squat position and make sure your feet are flat on the ground. If you're on your toes, you're more likely to tip forward or backward. A flat-footed stance is also kinder on the thigh muscles - especially if you're going to be in this position for a while. If you feel unstable, spread your feet wider. Finish your business by aiming for the hole, adjusting your position slightly if you find that you're missing completely. This is the tricky part but don't worry: practice makes perfect. When you're finished, use the bowl to pour water over your privates whilst trying to avoid spilling any of it on your clothes. If necessary, use your left hand to help rinse and clean. Use the water provided to flush the toilet. Pour it along the side of the pan, so that it swirls around and cleans the whole bowl before going down. If the bucket or bowl was filled when you came in, be courteous to the next person and refill it before you leave. If there is soap available, make sure to wash your hands thoroughly. If not, make sure that you do so before handling food or touching other people, in order to stop the spread of germs. Be grateful that squat toilets exist, because although they're harder to use at first, they are more hygienic than western toilets in areas with inadequate plumbing. If using water (and your left hand) to clean yourself is a bit too much of a culture shock, consider keeping a supply of tissues, toilet paper or wet wipes upon your person at all times. Don't flush your paper, however, because squat toilets have delicate or nonexistent plumbing and paper will almost always cause a blockage. Instead, dispose of it in the nearest trash can. Keep a small bottle of anti-bacterial hand-gel in your bag. Soap is a rare commodity in the world of squat toilets, and most won't have hot water or a sink. This is especially important if you're planning on keeping things traditional and using your hand! Be careful that you don't lose your wallet or any other items stashed in your back pocket while assuming the squatting position... because trust us, trying to retrieve them won't be fun. If there is a toilet attendant, leave a big tip - after all, it's a crappy job. If using a squat toilet doesn't sound like your cup of tea, try to find an upmarket hotel or Western-style restaurant. Usually, these will have flush toilets as well as or instead of the squatting kind.